Recipes Make Delicious Beef Rolade .Rolade is one of the refined cuisine of beef formed the rolls lengthwise and then cut into pieces. Its contents can be tofu or vegetables. This Rolade tastes very delicious according mimin, just because of the way makes it a bit complicated so Rolade rarely do we find in the menu daily, usually served at family gatherings or weddings. 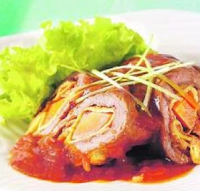 Well this time we will share how to create Rolade beef, so you can make it one of the daily menu for the beloved family. Guaranteed family members definitely ask again this Rolade menu. If you have this, you will continue the spirit to continue to be creative in cooking. Rolade beef are ready to serve you along with the sauce while still warm.